Today we’re releasing the first of six new “See the Great Plains” ecotourism posters. These posters will feature sights most often found in states other than Nebraska. Though the Coalition is based in Nebraska, we wanted to let other states shine in this new series. First up is the black-footed ferret, which represents South Dakota. South Dakota’s Conata Basin, at 420,000 acres, is one of North America’s most intact grasslands. The basin is home to a number of black-footed ferrets, one of the rarest mammals in North America. The ferret was thought to be extinct for years until a small population of 18 animals was found. A recovery program was launched and now the ferret, though still endangered, shows greatly improved numbers. 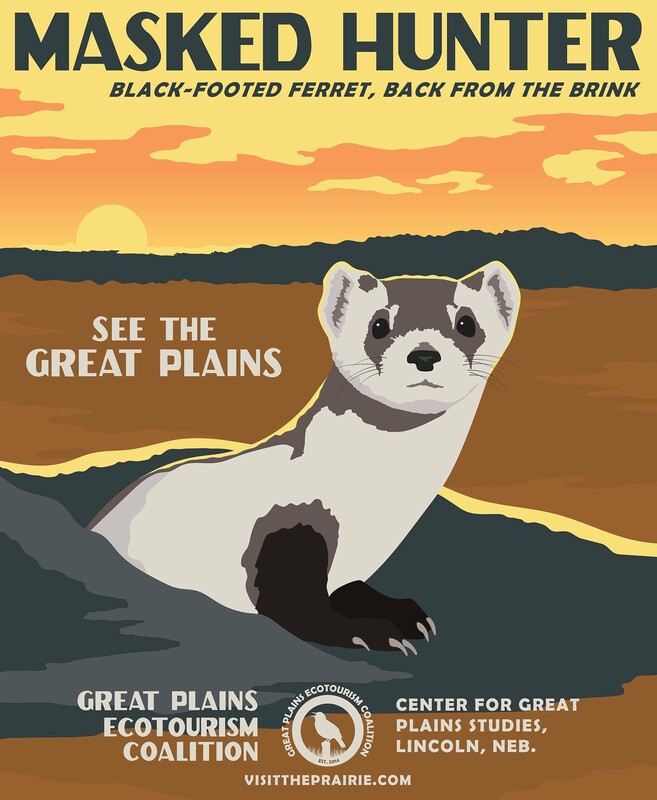 The ferret poster is currently available at the Great Plains Art Museum in Lincoln, Neb., and online at UNL’s Maps & More store.